Traffic congestion in Dubai has been reduced by up to 63 per cent even as money lost annually due to waste of time and fuel in traffic has come down by 51 per cent over the last five years. Around Dh2.4 billion were lost in time and fuel loss due to traffic congestion last year, less than half of the whopping Dh4.9 billion lost in 2005, the year Roads and Transport Authority (RTA) was founded, Arabic daily Al Khaleej reported. “The total value of saving time and fuel since the establishment of RTA amounted to Dh35.7 billion, a direct benefit of dozens of infrastructure projects completed by RTA in the last few years,” said Mattar Al Tayer, Chairman of the Board and Executive Director of RTA. 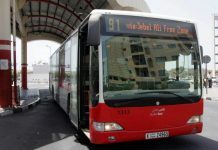 He said the delay per daily trip was reduced from 15 minutes to 5.5 minutes, improving by an incredible 63 per cent, which resulted in the drop of average time for the journey between the fourth intersection on Sheikh Zayed Road and Al Mulla Plaza from 88 minutes to 28 minutes. The target was achieved after several infrastructure projects were completed simultaneously, including the completion of Business Bay, the improvement of Al Ittihad Road, the expansion of Sheikh Zayed Road, opening of new Al Garhoud Bridge and the Floating Bridge, as well as the development of Emirates Road and Dubai Bypass Road. The opening of Dubai Metro has also had a positive impact on traffic. Thanks to the tremendous work, Dubai ranked thirty-fifth in the quality of the infrastructure in the last evaluation conducted by world city mayors. During the last five years the length of roads in Dubai increased by 29 per cent, while the bridges increased by 195 per cent, jumping from 108 to 319. The number of tunnels also increased by 57 per cent. Al Tayer added that the increase of lanes across Dubai Creek from 19 in 2005 to the current 48 has played a major role in reducing traffic.